Hulu has revealed a weekly rollout of titles via their official blog. This week, they announced Doctor Who’s modern episodes through the first half of Series 7, as well as 75 episodes of classic Who, Torchwood, The Sarah Jane Adventures, Life on Mars, Robin Hood, The Fades, Survivors and more. Next week they will roll out their new selection of dramas and Masterpiece Classics (think Whitechapel, Wallander and Bleak House). October 1 will bring sitcoms and October 8 will offer factual and natural history programming, including Sir David Attenborough documentaries and Top Gear. All told, more than 2,000 episodes of television will be added to Hulu’s services within the next year, which is pretty excellent news for those of us who want as many ways as possible to watch our British favorites. It’s certainly an exciting trend to keep an eye on – who knows if this is successful maybe more current properties will also become available in future, as Hulu has done with Misfits, The Thick of It and others. 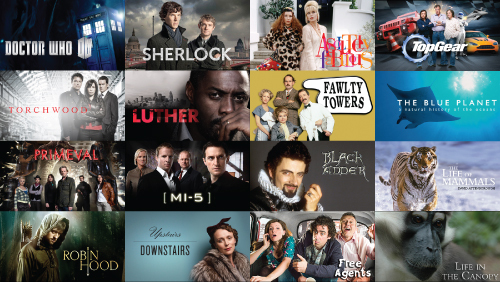 Are you excited to see more British programming available online? Anything you’re especially looking forward to watching? The second season of period drama "Harlots" is coming to Hulu this summer!